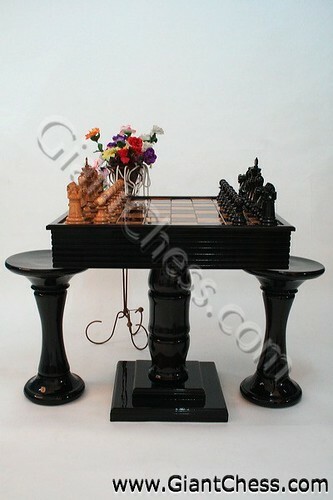 Black chess table is equipped by a drawer for extra storage under the table top. The table has sophisticated and clean look. It is covered by acrylic paint and clear acrylic lacquer. Has natural and tropical look. As furniture decoration, this can be placed in your coffee table. The table above is not alone. It completed with two stool that also made from Teak wood material and polished black. Our teak stool is comfortable and strong to uphold your body. This teak stool is also nice to used as indoor and outdoor furniture because adopts the shape and style of bar stool. The very elegant and attractive chess set which stand on the table. Black and brown chess pieces, carved in high quality product by professional craftsman. Those chess set is very durable for outdoor and indoor use, because it has made of best Teak wood material from Java Island. So you do not need worry about its quality because we choose the best wood that has dried before.